The UF College of Dentistry is one of the largest providers of high-quality, affordable dental care to Florida’s low income residents: more than 70 percent of the college’s patients meet federal low-income guidelines. Dental care at our DMD student clinic typically costs 30-50 percent less than private practice usual and customary fees. In addition to providing reduced-fee care in its student clinics, the college hosts several community outreach programs providing direct dental services and oral health education to individuals including those with special health care needs. 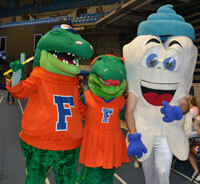 The college participates each year in the UF Campaign for Charities (formerly the UF Community Campaign). Past activities have included a silent auction, dunking booth and used book and media sale. The College of Dentistry is a repeat fundraiser for the American Cancer Society’s Relay for Life. 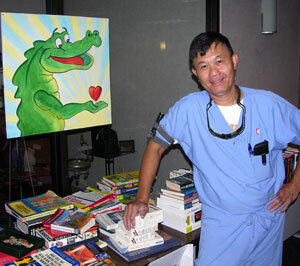 In 2011’s UF Relay for Life event, D.M.D. students raised more than $1,000 in donations as well as offering free oral cancer screenings for attendees. In 2009, six College of Dentistry faculty and students raised almost $20,000 by committing to having their heads shaved if certain fundraising levels were met. The Alachua County Health Department runs the “We Care” clinic at Santa Fe College with support from the Alachua County Dental Society. College of Dentistry students and faculty members volunteer to provide treatment to low-income Alachua County residents. The College of Dentistry has established ongoing partnerships in the Bahamas, the Dominican Republic, Ecuador, Guatemala, Cuba and Jamaica to sponsor international service trips and student exchanges. 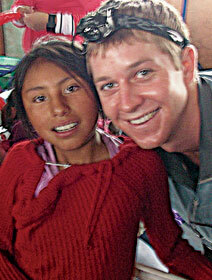 During college breaks, dental students travel to provide much-needed oral care to underserved patients with treatment including extractions, temporary and permanent restorations, silver diamine fluoride applications, fluoride varnish and oral hygiene instructions. These service trips allow people with very little access to health care to see a dentist; and they give dental students an opportunity to give of themselves. The University of Florida Student Health Professions Education Program, or UF SHPEP, celebrated the end of the first six-week program on June 29, 2017. The pilot program included 80 students who learned about professions in dentistry, medicine, nursing, physician’s assisting, pharmacy, public health and health professions, and veterinary medicine. The students, who are rising sophomores and juniors, came from all over the United States. The program is funded for a second time for the 2018 summer. You can find out more about the program here. 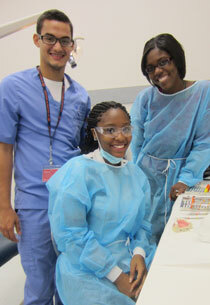 The Impressions program is a one-day program of activities sponsored by the Student National Dental Association. Its mission is to expose underrepresented pre-dental students to careers in dentistry and to the application and financial aid process, making participants stronger dental school applicants. If you are interested in learning about dental assisting, we have instructional videos available online here.